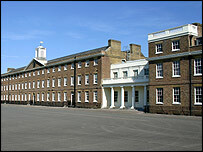 The historic Chelsea Barracks are to be shut down and sold off for development, Defence Secretary John Reid has said. The closure will end 145 years of military links with the site between Sloane Square and the River Thames. The 13-acre prime building land could raise as much as £250m from residential or retail development. About 300 ceremonial duties personnel will be moved to Woolwich Station in south-east London, which Dr Reid described as "a fitting home". Dr Reid also delivered a reprieve to Woolwich Station, another historic army base, which had been earmarked for closure. Following a two-year study, the Ministry of Defence (MoD) has decided to refurbish Woolwich Station, built between 1776 and 1802 as the home of the Royal Artillery (RA) - rather than close it when the last RA regiment leaves in 2007. Personnel from Chelsea Barracks, a target of an IRA bombing in 1981, may also be joined at the Woolwich Station by about 600 people from cavalry barracks in Hounslow, west London, if another defence use cannot be found for the site. Speaking at Woolwich Station, Dr Reid said: "Soldiers on public and ceremonial duties in London are one of the most striking emblems of our great capital city. "Historic Woolwich Station will be a fitting home for these soldiers. "The investment in Woolwich Station will provide new training, sports, recreation and accommodation facilities. "None of these improvements is possible at Chelsea Barracks without knocking down the whole site and rebuilding it. "Retaining Woolwich offers both good value for money and first-class facilities. The decision is a win-win for soldiers." 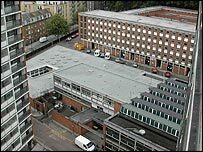 An MoD spokesman described Chelsea as a 1960s eyesore and said a move to the striking location of Woolwich was genuinely good news for the guards people and their families. Major-General Sebastian Roberts, General Officer Commanding for London District, said soldiers would welcome the move to Woolwich as it will mean a better quality of life for them and their families. "The decision to retain Woolwich Station means that the Army's 400-year-old links with the area can continue as strong as ever," he said.